How fearless am I? Picture me blushing as I answer, “Not very.” I’ve done a lot of things that took courage, but I was acting with my husband, which made the event far less frightening. However, one thing sticks in my mind that was life-changing. For several years I worked as the bookkeeper for our county tax assessor. The pay wasn’t great, but it came with good retirement benefits, had a short commute, was in a nice building, and the tax assessor was a friend. This was in an office with ten other women. Can you say drama! Most of the women were really nice but there were three whose performance and gossip mongering made each day a challenge. l loved my actual job—but the parade of divas in and out of my office sapped my energy. Yet, I had to be accessible and couldn’t just shut the office door. When I arrived home from work each weekday, my mind was mush from dealing with the spectacle at work all day. I dragged into the house too foggy to concentrate on writing. Still, I’m aware many writers succeed under those conditions. For years I’d wanted to write romances. I’d even started one to which I slowly added pages. That left weekends to write. In addition, I have several annoying health concerns that zapped me frequently. On Saturday mornings, I attended RWA chapter meetings or critique sessions. Sunday morning was church. I believed that if I could stay home, I could succeed. I didn’t tell my husband those feelings. Fortunately, my husband encouraged me to quit my job and write. I had to deliberate the possibility. Giving up a sure salary for the maybe of a writing career was a difficult decision. What if I failed? What if we needed my income? Ha, I was willing to take that risk. The next morning, I gave my notice. Yes, I gave up my day job and concentrated on writing. I sent out sample chapters and got rejections while I completed two books. One great day, I got an acceptance letter. Hooray, I was on my way! Four years from the day I quit my day job, I was published. I had my foot in the door, so to speak, with a traditional publisher. Now I’m indie published, which is so much better for me. In spite of that, I was extremely happy with my first sale. Stepping into the unknown carries a risk. That’s why I admire the heroine of my new release, GARNET, book 9 of the western historical Widows of Wildcat Ridge Series. Imagine the fearless courage required to become a mail-order bride. Worse, only nine months after her wedding, Garnet Chandler was widowed, left with her niece and nephew in her care and a café to operate alone. I hope you’ll give GARNET a read. A widow with two children to care for, a bounty hunter that is badly beaten, and the crime that brings them together . . .
Garnet Chandler has lost everything. The only things remaining are her café, custody of her niece and nephew, and what little bit of sanity she has left. After the deaths of her husband and in-laws, she has made it her mission to provide for the children. When the children are kidnapped, Garnet has to find a way to rescue the last ties to her family. What she doesn’t expect is the handsome bounty hunter that comes to her aid. Bounty hunter Adam Bennett is on his last job. He’s on the trail of a killer who escaped from prison and left a string of bodies in his wake. When he manages to catch up with the man, Adam is beaten and left for dead. Instead of dying, Adam vows to capture the killer and those that have teamed up with him, but he doesn’t count on rescuing two children in the process. Can Garnet and Adam join forces to capture the killer and rescue the children in time? Will the children be able to stay with Garnet, or will the grandparents take them from her? Can Adam teach Garnet that even though she thinks she doesn’t need a man, having one isn’t all that bad? 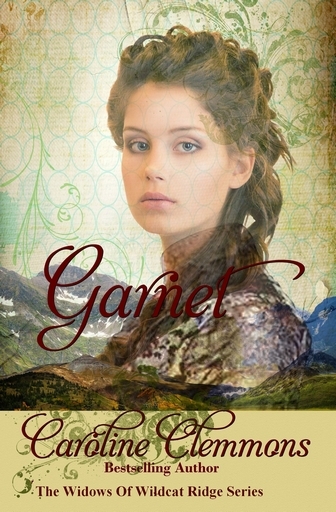 Garnet is a sweet historical western romance. Through a crazy twist of fate, Caroline Clemmons was not born on a Texas ranch. To compensate for this illogical error, she writes about handsome cowboys, feisty ranch women, and scheming villains in a small office her family calls her pink cave. She and her Hero live in North Central Texas cowboy country where they ride herd on their rescued cats and dogs. The books she creates there have made her an Amazon bestselling author and won several awards. Find her on her blog, website, Facebook, Twitter, Goodreads, Google+, and Pinterest. Join her Facebook reader group, Caroline’s Cuties, for advance news, contests, and conversation. this sounds like an interesting book. What a wonderful blog today. Have a great weekend.